Just punch in the coordinates and it takes you to the Bill’s logo at mid-field. We are reaching out to the Bills’ Nation around the country to offer these unique pint glasses. 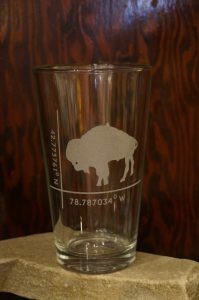 Along with the buffalo we can etch the name of the club, the bar or personalize them with the BB member’s name on the glass for an extra charge of $7.00. We sell the glasses for $16.00 a piece and $14.50 a piece for a multiple orders plus shipping. If you are interested in ordering glasses or have any questions please email us at artisanshands@gmail.com. Previous PostDrink Specials and TimesNext PostTons of Info, Preseason, Jets Game, etc.